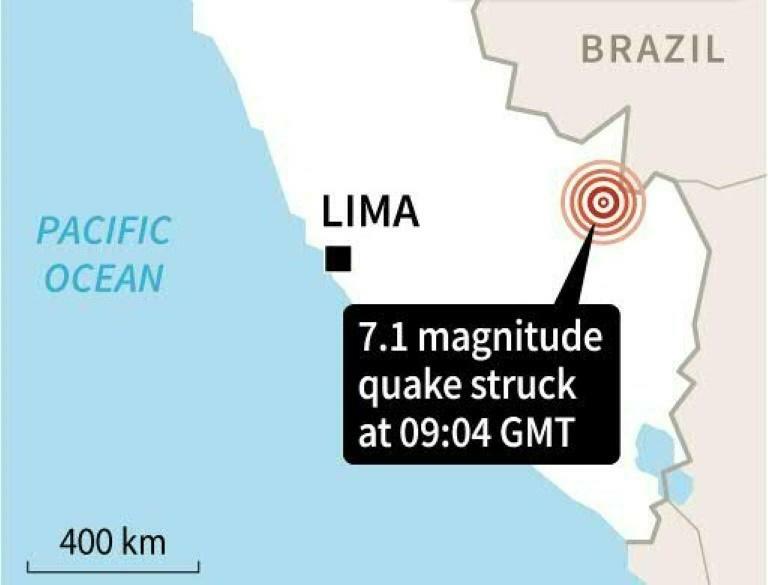 A powerful 7.1 magnitude earthquake struck Peru's border with Brazil on Friday, the US Geological Survey said, but national authorities said there were no initial reports of casualties or damage in the sparsely populated region. "So far no damage or victims have been reported and monitoring continues," said Peru's National Institute of Civil Defense (INDECI). The US agency said the quake hit at a depth of 609 kilometers (380 miles) on Peru's eastern frontier with Brazil. Jorge Chavez, the civil defense chief, said the depth of the quake had caused its force to dissipate, blunting its impact on the surface. "The depth has made it so there is no surface damage," he said on RPP radio. The earthquake hit shortly after 0900 GMT, about 140 kilometers west of the Peruvian town of Iberia, the USGS said.